Chemical Processing environments are primarily exposed to harsh chemicals such as acids, liquids and other solvents that can result to a harmful working environment. 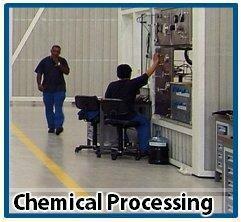 Chemical processing floors must be able to handle various chemicals and temperature. Chemical resistant floors offers low maintenance cost, efficient appearance, long wearing and resistant to chemical and physical forces to which chemical area floors are exposed to. High Performance Solutions, Inc., premium flooring and coatings specialist in the Philippines installs a complete range of chemical and corrosion resistant flooring, coating and lining systems. Our products perform and protects even on the most demanding workspaces.